As the spring weather comes, pastures and trees are coming back to life. Fruit trees are starting to bud, and within a month we hope to see some blooms. It's been a mild winter, but being a mountain farm, we are colder than the lowlands, and so the pollinators are still a few weeks out. 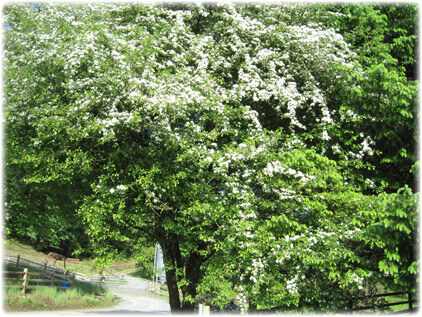 Our hawthorn tree in bloom --- a magnet for certain pollinator species. It's fascinating to watch these miraculous little creatures go from bloom to bloom. 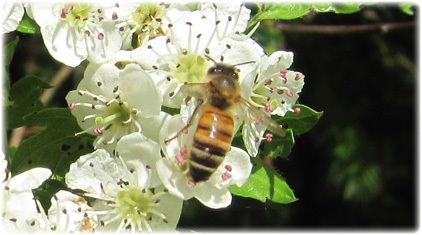 The entire planet is connected to the process of pollination. Dozens of the world's most important crops require bees and bugs to produce. Without the pollinators, there'd be far less food. This little pollinator will help produce several pounds of food in its lifetime. Sadly, there have been widespread bee-deaths (colony collapse disorder) which have cratered some of the commercial bee populations in North America, Asia, Europe and Africa. It's been getting worse in the past two decades. What's causing it? Pesticides are one answer (proven). GMO crops could be another. Mites, a virus, and (some say) cell phones are potential candidates as well. Lack of genetic diversity in the commercial bee populations may also be a factor. Another one of our miracle pollinators at work on the Hawthorn tree. And it's not just bees that are important. Much pollination is carried out by other flying insects, including certain types of flies, wasps, and the like. Considering what insects have to contend with (a slurry of agricultural chemicals) it's a wonder the pollinators have survived as long as they have. Researchers are claiming (current issue of the journal "Science") that commercial honey bees are not as successful at pollinating crops as wild bees. They maintain that the loss of wild insects in monoculture farms may have negative consequences for crop harvests. Organic crops may support wild bee populations more than non-organic monoculture crops, according to a meta-study published in the current issue of the journal "Ecology Letters". 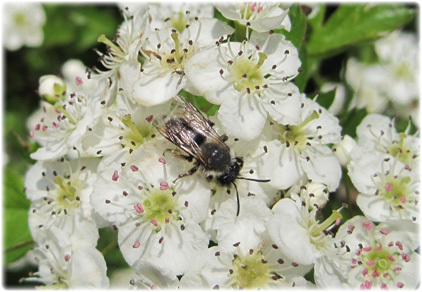 Researchers claim wild bees are more abundant in diversified farming systems. Why is all this important? When you buy from organic farms, you are supporting the survival of native pollinator species. That's good news for all of us. But it's not just "organic" that you should consider. It's also the extent to which the farm is diversified. Modern agri-business specializes in monoculture "farms" which grow one thing. Yet if we look at nature we rarely see monocultures. Rather we see a multitude of species, almost everywhere we look. That's one reason why diversified organic farms are more successful at supporting native pollinators. Every food-dollar that goes to local, organic farms is a dollar diverted from the pro-chemical/GMO "farms" which are killing the planet and stealing from the future. Thankfully, the tide is turning. More consumers are choosing food which supports life. They're asking questions, and realizing they can fight (and win) against an agricultural "system" which celebrates "cheapness" at the expense of future generations. Please tell your friends and family to support local organic family-farms.